Our professional Excavation Services in Palm Beach can be a smart and cost-effective way to make way for a new construction or renovation. XS Trash can offer comprehensive and reliable services at affordable rates. Our licensed Bobcat operators can be available for any project, including speedy and economical excavation services in Palm Beach. XS Trash is licensed, bonded, and insured for qualified services for residents, commercial businesses, and industrial clients. It can be risky to leave piles or dirt, gravel, concrete, metal sheeting, carpeting, outdoor waste, and other materials around your work zone unattended. Passersby can be at risk for serious injury, but with excavation services in Palm Beach, we can erase the mess fast. 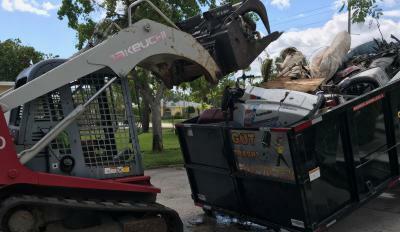 When the truckloads begin to add up, it can be overwhelming to find out how expensive and time consuming excavation services in Palm Beach can be. However, at XS Trash we can fit more debris into a single load with our large 21-yard long trucks. Plus, we offer price matching down to our lowest minimum so you always get the best deal.